Jan, I show the Outside diameter as 8.8 as opposed to 8.5. Anyway the pistons seals or Manschette can be obtained from SKF lubrication systems for so little money. The way I read the drawing there has been two revisions on the 301-024-2 part number. I actually have some of these in my. stock the main difference from the original pistons as I see it is the ,3 x1 mm with the 45 degree chamfer area on the face of the part. Yes you guys in Sweden are well use to both the imperial and metric system. In the late 1970 when I was stationed in Hanau Germany a group of Swedish Drag Racers would come once a year to race on our air strip. They had fantastic cars. We had what ever we could build or find. The local German guys also had some great machines. I was not a drag racer but my company sponsored the Drag Race Club and it was sure fun to talk with the guys and look at their machines. Swedish machine tools. You guys imported some wonderful machines into the USA. We loved them. But now with most all machines CNC things have changed a bit. I am working SKF in the USA to get the pistons. It will not be a success until they are in my hands. I many try a parallel effort while in Germany. Can I send the NBR O-Ring to a hotel or a private address in D (your name and address via PN)? It is for free because I have 4 and it has different dimensions. It is 15,47 x 3,53 instead 15,5 x 13,8. So you have to try if it fits the slot in your cylinder and seal your pump. Hello Jim, did I get you right that the springs and the seals still are available as spares from SKF? In that case, this is really good news for many 170 owners. The matter has been discussed repeatedly before in German but the earlier contacts wit SKF do not seem to have led anywhere. If you can verify that I haven't misunderstood this, I would like to inform about it in the German part of the forum. My 170 SD restoring is progressing, now assembling frame, engine and all sytems. 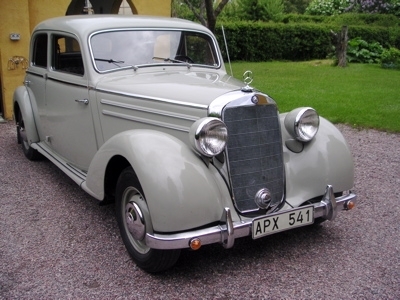 The car was modified by my father using the frame and front suspensión from a 170S. Could you confirm which gasket and pistons, etc I could get nowaday? I used the search function but there is so much info I am not sure where to start from. I answer here because it doesn't seem to be possible to make an attachment in the PN section. Besides, there may be someone who can help Javier better than I do. I attach the section on central lubrication from the English workshop manual. I have made some comments to picture Z/04. First, I doubt very much that you will find any new or even NOS spare parts. You may have to look for used parts if you need replacement. Specifically, if the Vogel pump leaks into the interior, the gasket at the pump plunger is worn or faulty. In the older pumps, like in picture Z/02, the gasket could be tightened within certain limits, but in the later pumps (picture Z/04) the gasket is kept in place by a bushing which is fastened by a lock screw and non-adjustable. In this case, you will have to disassemble the pump and replace the gasket. I suspect that you will have to fabricate a new gasket yourself. - With the pump disassembled, you should control and possibly replace the rubber disc which serves to prevent oil leakage when the pump is inactivated. I'm afraid that you will need to punch that too out of a neoprene rubber sheet. All of the rubber parts for the Vogel system can be purchased from SKF Lubrication systems. The Argus parts are another sad story. I have yet to locate detailed technical information for the Argus system. The O- Ring in the pump is a DIN O- Ring and can be obtained from multiple sources. Bola has some for sale. See his post for the correct size and spefications. That should solve the probin of oil leakage into the cabin. Parts for the Argus oil estributors remain a mystery. Hello Jim, thank you for this information. I will pass it on to the German speaking community. Maybe you will be able to find out something this way. I am not sure if the oil distributors are Vogel or Argus, here I post some pictures and maybe someone could confirm that, so I can search the apropiate rubber parts. Thanks a lot Jim for your information on Vogel spare part numbers! I bought a complete set of 15 springs and seals from SKF in Sweden for less than $50. Still haven't found out anything worth sharing about the Argus system though.